Mica Powder Pigments are widely used for producing of unique colorful soap. They create effect of depth, shine and shimmer of various shades.These Powdered Pigments Set do not migrate. They are referred to as fast melting dyes. Soap making kit is easy to use as bath bomb colorant or as soap dye supplies. Mica Powder Pigments using is very thrifty and non-toxic. It is not absorbed by skin and leaves no traces. It keeps its brightness for a long time and doesn’t fade. It is a perfect choice both for beginners and experts in soap boiling. 1）Before melting the base, cut it into small cubes (1-2 cm), so it will melt faster. If you are melting the base in a microwave oven, use a special heat-resistant dish, glass or plastic cups, 3.5 ounces (100 grams) of base melts in the microwave for about 20-30 seconds. Using water bath, the base melts at 158-176 °F. 2）Add Mica Powder Pigments at the rate of 0.002 – 0.007 ounce per 3.5 ounce (100 grams) of soap base, depending on how saturated color you want to get. When you add Powder Pigments to melted soap base, stir thoroughly the mass in order to avoid lumps. 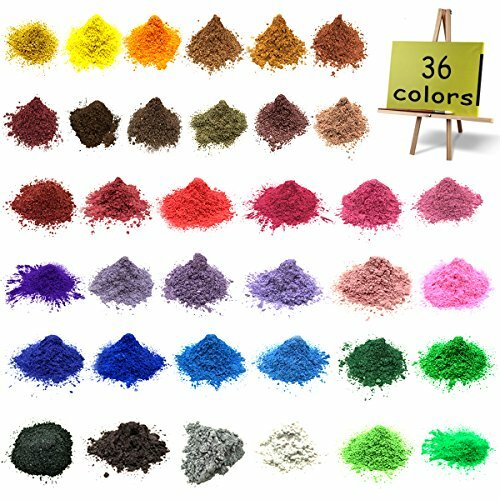 For more convenience, it’s also possible to add small amount of glycerin or spirits to Mica Powder Pigments and then add this mixture to liquid base. Then pour the soap into the mold, sprinkling it with alcohol, and repeat this procedure afterwards, as the foundation was poured, this must be done to remove small bubbles and foam. 3）Alcohol is also used when making multi-layer soap. You need to sprinkle the frozen layer before pouring the next one – the layers are better attached to each other and do not break down during the use. 3.5 lbs (1588 grams) of the base freezes in the mold on average in 5 hours.